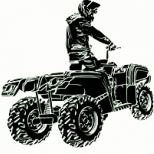 ATV repair, modifications, and general work being performed on your ATV. You can post individual photos or start an album in this category. It was a couple of years ago, part missing.Kazuma Falcon 150cc automatic - $ 175. I did not have any connectors, a chassis is incomplete, drive, gasoline ... I have to get $ 175 to $ 280 to make it all right! Was given this atv with a locked up engine. Found piston rusted to cylinder. Piston rings stuck. Out riding the Telkwa pass and about 60 km from truck when rear left tire falls off.